When looking to hire a tree trimmer, also known as a climbing arborist, you should be aware that they come with various levels of expertise. In the state of Virginia, there is no licensing requirement, so it’s caveat emptor or buyer beware. With that said, there are industry certifications that can help you determine if the “tree service near me” you just searched for is qualified to perform the work you need them to do. 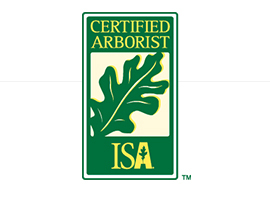 The International Society of Arboriculture (ISA) is the organization that is tasked with certifying arborists. 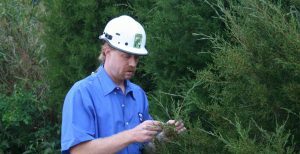 To become an ISA Certified Arborist, a candidate must qualify to take the exam. He or she must have completed at least three years of full-time experience in arboriculture; or have a minimum two-year degree in arboriculture and two years of practical experience; or a have a four-year degree in a related field and one year of practical experience. Additionally, they must pass a rigorous ten domain exam made up of 200 multiple-choice questions within three and a half hours. The candidate must pass each of the ten domains independently, have a minimum overall score. The ISA Certified Arborist designation described above is for individuals only. Another, even more rigorous standard that you can apply when hiring a tree company is the Tree Care Industry Association’s Accreditation. TCIA Accreditation has only been obtained by approximately 1% of all tree care companies in the United States. To become accredited, a company must undergo a demanding audit of all aspects of their operation including financial, field operations, safety, record keeping, marketing, equipment, vehicles, and more. 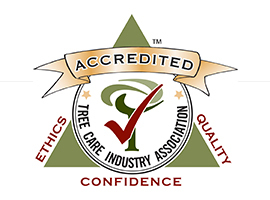 Accreditation is the “Good Housekeeping Seal of Approval” for the tree industry. It’s important to hire a qualified arborist to prune your trees because the damage that an unskilled tree pruner can do may be hard to rectify. A skilled arborist always has a good reason for each pruning cut he or she makes. They might be removing dead or dying branches, or those with disease or insect infestations, or simply cutting back from a building or sidewalk. In addition, they focus on keeping the overall structural integrity and aesthetics of the tree intact. A good climbing arborist should be able to recognize problems, often before they get out of hand. Early diagnostics can often save the life of a valuable tree. Disease and pest problems that are discovered before they reach the point of no return can be controlled by a knowledgeable tree expert. Structural issues like stress cracks, decay, unnatural leans, lightning strikes, are often noticed by the alert tree expert. Experience and training are the name of the game, but only if the experience is of the right type. A tree cutter with twenty years under his belt, but not performing the work according to industry standards, will probably not be doing your tree any favors. If you live in northern Virginia, especially Fairfax, Arlington or Loudoun county, you can trust the arborists at Growing Earth Tree Care to do top quality tree work. They not only have several ISA Certified Arborists on staff, they are also accredited by the Tree Care Industry Association and have an A+ rating by the Better Business Bureau.